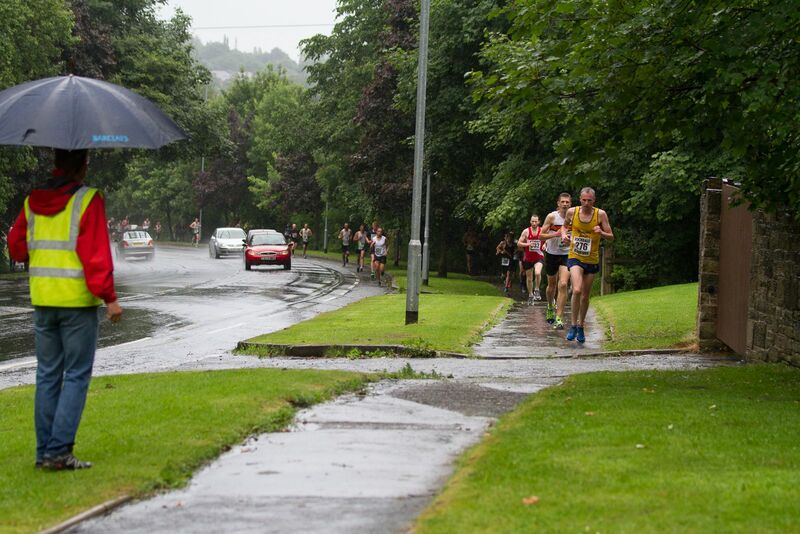 2014’s race report started as follows: “Tuesday 1st July 2014: On a warm and muggy evening in Rochdale …” This year, on Tuesday 7th July 2015, even sheltering under the trees in Springfield Park, as huge rain drops thumped down from above, there was no escaping the fact it was not warm, nor muggy – it was cold and absolutely hammering it down. Nevertheless, despite the heavy rain and the roads becoming rivers, Belle Vue Racers enjoyed a successful evening with some outstanding performances. Alison Sedman (42:47) was again the first Belle Vue woman home in fourth position overall, also winning her age category, while Vicky Smith (45:34) and Phoebe Wallbank (46:14) were second and third Belle Vue women home, with Annie Hirsch (47:30) in next, coming second in her age category. With Mark Ross (40:58) and Vic Walsh (40:00) the third and second Belle Vue men home, it was left to Daniel Anderson (38:57), on his debut on the roads, to lead the team home. Daniel finished 20th overall which, in such a high-calibre event, is an outstanding result. Highlight of the evening however was Daniel Seymour taking Barry Guy on the line in a photo finish, both athletes recording the same time. Reports of elbows being used are as yet unconfirmed. No place for “age before beauty” at Belle Vue it seems.